Games a better way to learn than books ? 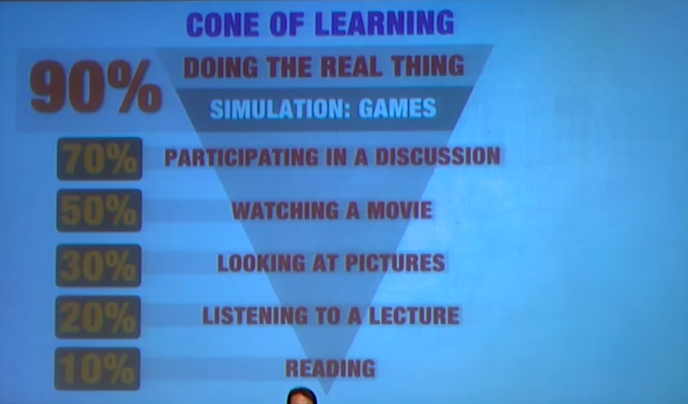 Simulation games seem to be the best way to learn, followed by participating in a discussion, watching a film and looking at pictures. Listening to a lecture and reading are the “worst” ones apparently. Doing the real thing seems to be the most efficient. Obvious, but we don’t always put that in the right perspective and remember that we shouldn’t just focus on reading to pick up a subject, for the same reasons as we can’t become good at a job by just reading books, nor be good at sports or socialising by just reading book about it. That depends on the subject of course. In my opinion, that’s not always true, low-level discussion or games cannot compete with a well-written book. The cone still makes sense though, more involvement generally means quicker learning. In order to learn languages, I find it essential to participate in discussions (doing the real thing) and talk, definitely faster than just learning books. Book however contains essential grammar rules, and the excellence in terms of quality, so they can’t be ignored. I guess the same applies to similar subjects. The best way is the right mix of the various things, and paying attention to the balance of those, in order to adjust it according to results. In case of software development, again, doing the real thing (download and play with the framework) is enormously more efficient than just reading the manual from A to Z. By skipping the manual you might miss something, but you can always skim through it later once you already know how things work, you’ll already understand most of it and the reading will be ways faster.